Nicaragua Conference consists over 30 churches, most of them located in the western part of the country around Managua and Masaya. All have arisen since 1965. Nicaragua also overseas the churches it pioneered in Costa Rica. In addition. Nicaragua was instrumental in Guatemala, where a group of young churches affiliated with us and, in 2010, became our 10th national conference. 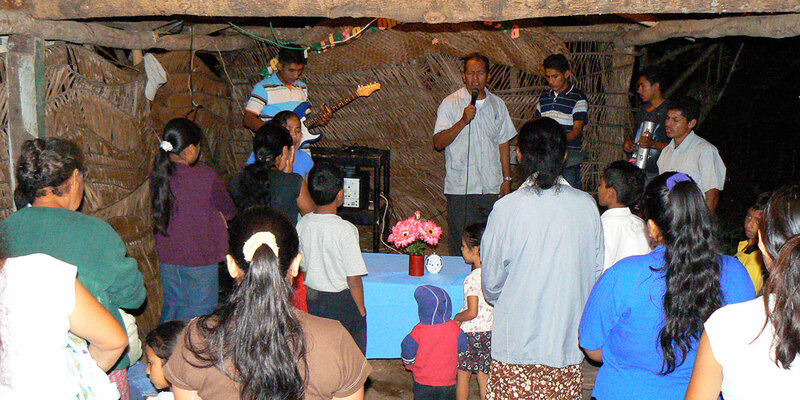 The churches of Nicaragua were organized as a self-governing conference in 1993. 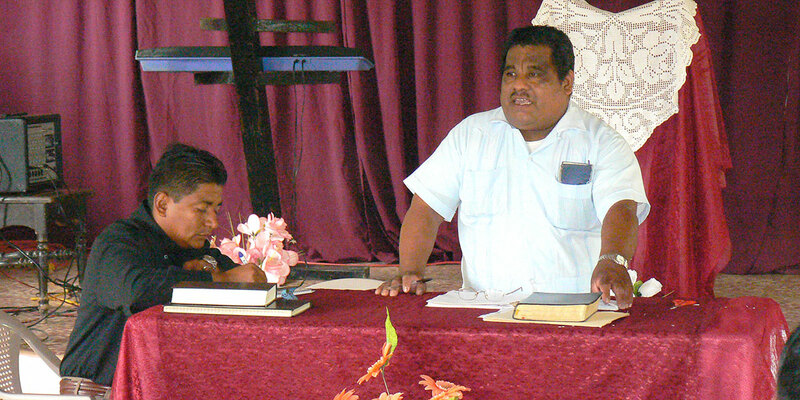 They were among the seven charter conferences when the United Brethren in Christ Church International was formed in 2001, at which point Nicaragua became an official national conference. 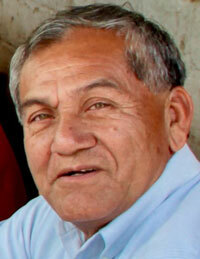 Armando Lopez is superintendent of Nicaragua Conference. Geographically, Nicaragua is the largest country in Central America. It is slightly smaller than the state of New York. 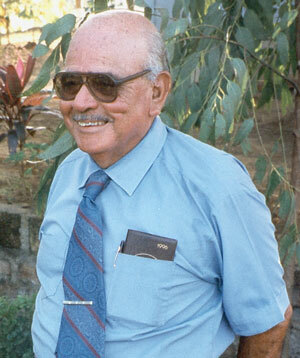 In 1965, Honduras Conference sent one of its pastors, Juan Campos, to Nicaragua to start churches there. However, very little happened until Rev. Guillermo Martinez came from Honduras in 1969. Guillermo Martinez (right, with wife and child) was born in El Salvador. Orphaned at an early age, he was taken in by an uncle living in Honduras, and that’s where he grew up. He became a Christian in 1940, and in the early 1950s met UB missionary Archie Cameron, who got him into a Bible college. In the years ahead, Guillermo became one of the most respected leaders in Honduras, and pastored a number of churches—Jutiapa, Tela, Llamapa, Sambo Creek, Corozal, and others. When the 1969 Soccer War erupted between El Salvador and Honduras (precipitated by a soccer game, thus the name), Guillermo, like other Salvadorans living in Honduras, was arrested. He was detained in the La Ceiba soccer stadium for two months. Eventually, the missionaries secured his release on the condition that they send him out of the country. With a Honduran wife, Guillermo couldn’t go back to El Salvador. Instead, he agreed to go to Nicaragua to work with Juan Campos, who by that time had started churches in both Managua and Masaya. 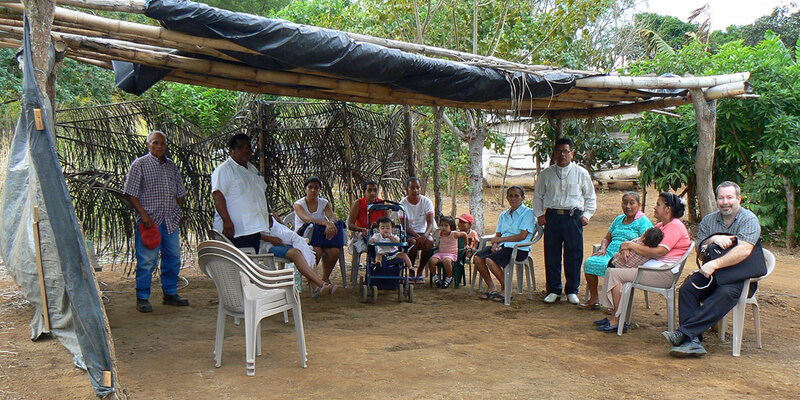 The Martinez family soon settled in Masaya, and within a year, 60 persons in that staunch Catholic country had become Christians. When Juan Campos ceased his involvement with the United Brethren church, Guillermo Martinez became superintendent, a role he held until his retirement. He passed away in September 2009. The Sandinista revolution of 1979 started almost in Martinez’s back yard in Masaya. 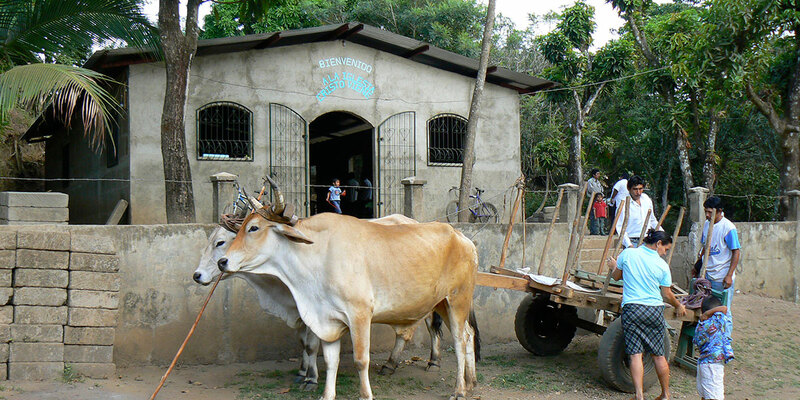 The UB churches in Nicaragua weathered the years of Sandinista rule, and since the establishment of democracy and national elections in the 1990s, the church has aggressively expanded from less than 10 churches to over 30 churches. The Nicaragua Conference was officially organized in 1993. In 1995, Nicaragua and Honduras cooperated in starting a new work in Costa Rica. Nicaragua has provided oversight of the churches in Guatemala until, in 2010, they were established as a national conference. No UB North American staff members have ever served fulltime in Nicaragua. However, work teams frequently visit Nicaragua, and Jeff Dice and his family, non-traditional Global Ministries staff, serve in Nicaragua a few months each year to assist work teams and churches. 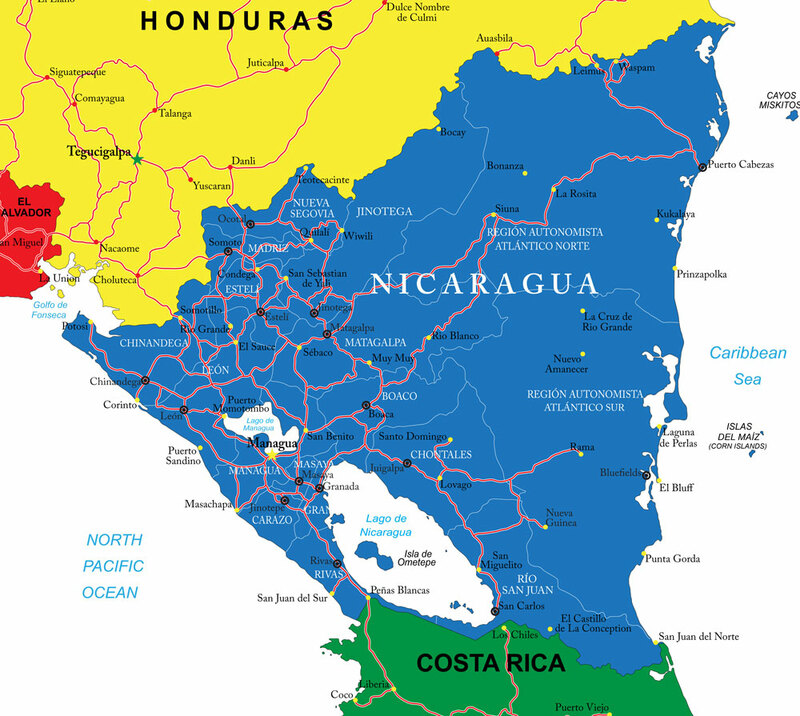 The name “Nicaragua” is derived from the name of an Indian tribe, the Nicarao, who lived along Lake Nicaragua. It is estimated that about one million Indians inhabited what is now Nicaragua. But with 30 years of the arrival of the Spaniards, that number fell to a few tens of thousands as a result of disease brought from Europe. The Spanish entered the region in 1522, and for the next 300 years ruled the area from Mexico City and, later, from Guatemala. Nicaragua, along with other Central American countries, gained its independence from Spain in 1821 and became part of the Federal Republic of Central America, which also included Guatemala, El Salvador, Honduras, and Costa Rica. Nicaragua left the federation in 1838. Since then Nicaragua, like other Latin American countries, has experienced periods of dictatorship, military rule, and civil war. The United States occupied Nicaragua 1912-1933, primarily because of economic interests. A charismatic leader named Augusto Cesar Sandino fought a guerilla war against the US occupation; he was assassinated in 1934, but not until after the American marines had withdrawn. The Somoza family took power in 1936 and ruled the country as a dictatorship until 1979, when a popular revolt against Somoza broke out across the country. Several opposition groups united under the leadership of the Sandinista party (named after Sandino) and seized control of the country. With the country in ruins, the Sandinistas instituted radical reforms in numerous areas—land reform, working conditions, unions, neighborhood watch groups, equality for women, and improved public services. In 1981, a US-backed guerilla movement known as the Contras began waging a guerilla war against the Sandinistas, using bases in Honduras and Costa Rica. The Contra war came to an end in 1990, when Sandinista leader Daniel Ortega lost the presidency in a national election. The Sandinistas peacefully transferred power to the winner, Violeta Barrios de Chamorro, who became the first woman to be elected head-of-state in Latin America. The Sandinistas continue as a political party. In fact, Daniel Ortega was re-elected president of Nicaragua in 2006.